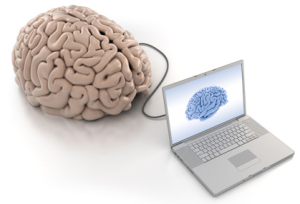 Interactive courses delivered via the Internet. 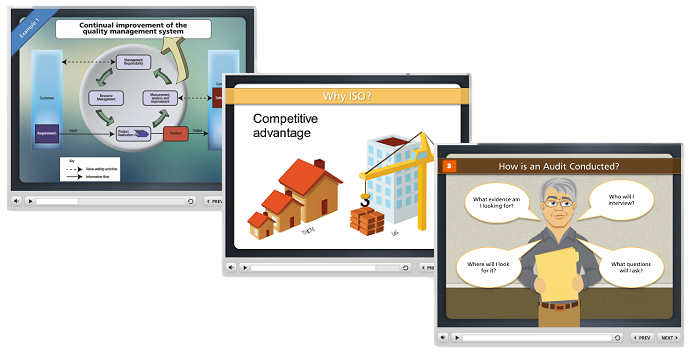 Organized into modules, Online Training courses combine animated slides, audio, video, scenarios, quizzes and other elements. They can be completed in stages…at your own pace…on your own schedule. 2) Select your course and pay. The ideal way to expand your organization’s understanding of Quality Management , ISO 9001:2008, and the associated responsibilities and benefits. 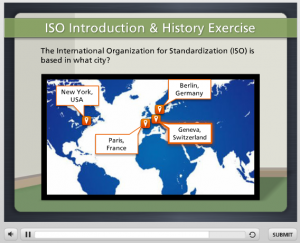 Animated and interactive content provides an introduction to the world of ISO 9001:2008. Through independent, on-demand training, participants will gain an understanding of the history, principles and fundamentals of Quality Management, Quality Management Systems, and the ISO 9001:2008 standard itself. 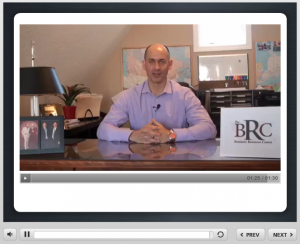 Visit the Course Page for a full course outline. OR click the button to the left to create an account and start training now! 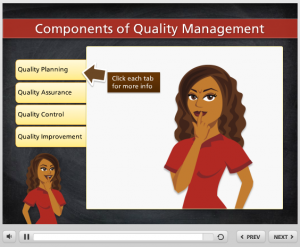 What does a Quality Management System look like? Lower training costs and increase knowledge. It takes just a few mouse clicks to get started. Available to everyone. Everywhere. Anytime. Train at your own pace and schedule. Less time away from other responsibilities.